There is nothing more valuable in life than good friends. No matter how old you are, we all need human contact – it’s key to our well-being. Friendship transcends money, status, and reputation, to name just a few. And while friendship is important at every stage in life, it is especially vital in later years. By staying in touch and sharing experiences with others, it makes it possible for seniors to remain active, mentally alert, and connected to life. Without a friend or close relative to provide support, senior citizens tend to shut down emotionally, mentally and physically, especially if they are dealing with health issues, have lost a spouse, or are coping with newfound feelings of depression or loneliness. There are many ways that senior citizens can maintain late-in-life friendships these days, even if mobility or transportation is an issue. Seniors can meet up at regular local events at senior centers, churches, or other community facilities. They can arrange to go for daily or weekly outings with their loved ones or they can put together a hobby or activities group based around mutual interests such as reading, music, art, and handicrafts. Scheduling regular social events, something that establishes a routine, is great for seniors and provides them with something to look forward to. There are also a number of modern technologies that seniors can use to their advantage. Aside from phone calls with friends, seniors can participate in social media, such as Facebook, Pinterest, and other online channels and communities. Communication tools such as Skype video enable seniors to see who they’re talking with, making it a more personal and enjoyable connection. By seeing and hearing the other person or persons, seniors can better enjoy “visiting” with grandchildren, old classmates, and friends across the country and even the globe. 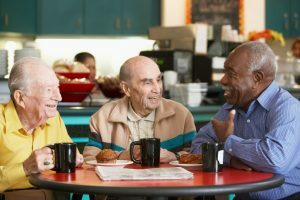 Without the pleasure of friendship, socialization, and human contact, it becomes harder for elderly adults to find purpose and passion in daily living. If your aging parent or someone you know is without regular social interaction and having a hard time maintaining friendships as they grow older, consider helping them by presenting some activity options or even suggesting a caregiver. If you’re the child or grandchild of a senior, your busy schedule might make it challenging for you to visit your loved one. However, it’s important to realize that your visits – however brief and sporadic they may be – can make a world of difference. Likewise, visits from a volunteer or a caregiver, and the companionship they provide, can brighten an elder’s day. Those hour or two visits can fill a void for a senior who may have difficulty getting out of their home for socializing. It’s easy to underestimate how friendship and companionship can mean the difference between joy and sadness in someone’s life. It might help to remember this famous quote about happiness: “It has been said that we need three things in life – something to do, something to look forward to, and someone to love.” Having friends can fulfill all three. This entry was posted in Caregivers, Tips and tagged friendship, seniors, tips. Bookmark the permalink. Comments are closed, but you can leave a trackback: Trackback URL.